This text is an ideal resource for the individual performing or learning to perform a surgical procedure. The most qualified experts in the fields of surgery and pathophysiology explain in easy to understand and practical terms the mechanisms by which a disease affects each organ. Mechanisms of Disease in Small Animal Surgery not only helps the practicing veterinarian better understand the function of specific organs effected by disease; but also helps the practitioner explain it and the selected surgical treatment to the client in an easy to understand manner. The highly visual format contains over 500 highly quality illustrations and well conceived tables. 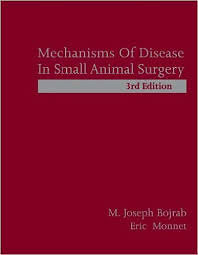 It is enormously helpful to veterinary student studying for the boards.